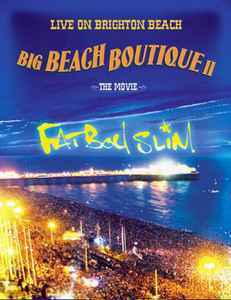 © 2002 Big Beach Boutique An Eagle Vision is a Division of Eagle Rock Entertainment Ltd.
Footage of Fatboy Slim's set from Brighton Beach. Tracks 1 to 21 have optional commentary with Fatboy Slim and his mates. Although not mentioned in the sleeve; track 3 is actually 77 Strings (Original Instrumental), track 6 is At Night (Kid Crème Club Mix), track 8 is Get Me Off (Superchumbo Supergetoff Remix), track 9 is Love Story (Tim Deluxe Remix). Tracks 10 and 15 have alternate video footage that you can select by changing the angle. Title 22 is broken into 6 chapters and is partially accompanied by the songs Praise You and Right Here Right Now by Fatboy Slim. Title 23 is accessible by pushing up in the main extras menu, then entering "303" as the code. It is split up into 10 chapters and contains the songs We Love Sax by Tim Deluxe, Lazy by X-Press 2, It Just Won't Do by Tim Deluxe, Mountains by Meeker, To Get Down (Fatboy Slim Mix) by Timo Maas, Always & Forever by The Space Cowboy, and Reach Out by Midfield General. Title 24 is shown when you win the Dolphin Derby game in the extras menu and is split up into 2 chapters. It is accompanied by the song City Approach by Grandadbob. Title 25 is shown when you win the Weapon Of Choice game in the extras menu and is split up into 2 chapters. It is accompanied by the song Tied To The Mast by Lo-Fidelity Allstars. The first chapters of both titles 24 and 25 are footage of a roller coaster ride in first person. The songs At Night (Kid Crème Club Mix) by Shakedown, Tied To The Mast by Lo-Fidelity Allstars, and Haze by Danmass play in the menus. This probably has to be one of the most famous DJ gigs of all time. In front of 250, 000 people, Norman Cook spins some great Funky House, Deep House, Big Beat, and . . . er . . . All Saints!!! One big flaw though is, that the needle skips on a couple of the tracks, and the DVD editors forgot to re-edit the set to remove them, speaking of editing, the actual editing of the crowd and Norman is superb. Overall, a nice set with a mixture of both Upfront and Deeper House music from the early 2000's.